The default file type for Word documents has been .docx since Word 2007. It's part of Microsoft's Office Open XML family, which also contains .xlsx (Excel spreadsheets) and .pptx (PowerPoint presentations). So a .docx file isn't one file, it's a whole bunch of files that are parsed by Microsoft Word into a coherent whole for the user to work on. Word is essentially a GUI front end for XML. 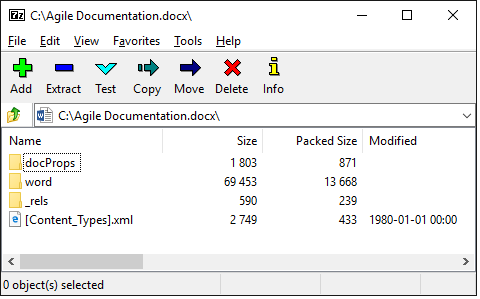 The correct technical term for a Word document is a package (the .docx file) which is comprised of parts (the .xml files) which are connected using relationships (the .rels files). \docProps\app.xml - Metadata from the application. \docProps\core.xml - Metadata from the document. \word\theme\theme1.xml - The default theme for the document. \word\_rels\document.xml.rels - The relationship file that contains the relations between document.xml and other parts of the package. \word\document.xml - The actual content in your document. \word\fontTable.xml - A list of all the fonts used in the document. \word\settings.xml - Various documents settings, including defaults and security settings. \word\styles.xml - The styles that are available in the document (not the styles that have been used, all the styles that are available). \word\webSettings.xml - The web-specific settings used by the document. \_rels\.rels - The package level relationship for the document. [Content_Types].xml - The various types of parts that are used in the package. If you add things to your document then other folders and files will be created by Word. For example, embedded media such as images will be in the \word\media folder and embedded files such as spreadsheets will be in the \word\embeddings folder. An important issue to note is that when you embed an image and then edit it, the original image is stored in the \word\media folder, and the edits are stored in \word\document.xml, in the <w:pict> element. If you've cropped or otherwise obfuscated private information using Word's inbuilt editing tools then anyone who opens the .docx package using something like 7-Zip can still see the original picture. MSDN contains plenty of useful OOXML information for users and developers, and the specifications and XSD information linked to above will tell you everything you could ever want to know about how the .docx structure works. Finally, if you're thinking that this is very interesting but not particularly useful for writing topic-based documentation then you should know that Yes, you can write DITA in Word!